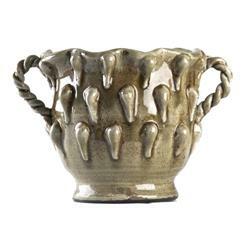 Hand built and glazed to create a classic line, this small pot evokes ancient style and sophisticated textures. Use as an accent piece on a well-set table, or to hold fresh cut flowers. Glazed in an earthy grey, this pot blends into Mediterranean and Asian influenced environments with ease.